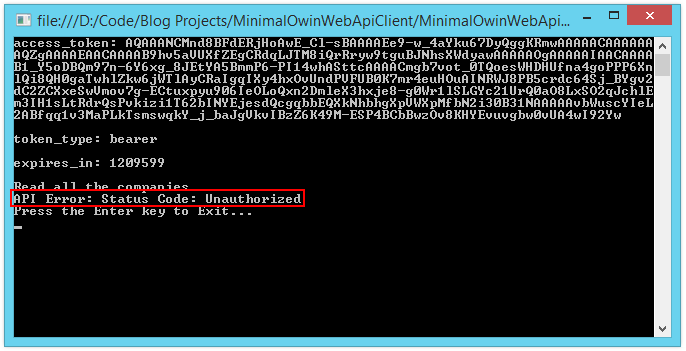 In the previous post in this series we learned how the most basic authentication and authorization elements fit together in an OWIN-based Web Api application. We have seen how to authenticate a user using an Authentication Server embedded within our application, and how to add an elementary claim to use with the [Authorize] attribute. To this point, we have been avoiding using the ready-built Identity framework, and instead we have been focusing on understanding how these pieces interrelate. We will continue this approach (for now) here, by adding some concrete authorization models to our application, and a persistence layer to store important user data. Once again, we will be doing most of this “from scratch,” in a pretty minimal fashion. I want to explore the relationships between project components without too many distractions. So we’re not attempting to design the optimal auth system here or demonstrate the latest best practices. But hopefully we will come away with a better understanding of how a fully developed authentication/authorization system such as Identity works in the context of our application. Understanding THAT gives empowers us to utilize tools like Identity more effectively. In this series of posts we started with concepts, and are building slowly build from there. Part I (last post) – We will examine the basic OAuth Resource Owner Flow model for authentication, and assemble to most basic components we need to implement authentication using this model. We will not be concerning ourselves with the cryptographic requirements of properly hashing passwords, or persisting user information to a database. We will also not be using Identity, instead implementing security using the basic components available in the Microsoft.Owin libraries. Part II (this post) – We will mock up some basic classes needed to model our user data, and a persistence model to see how storage of user data and other elements works at a fundamental level. Part III – We will replace our mock objects with Identity 2.0 components to provide the crypto and security features (because rolling your own crypto is not a good idea). Branch: auth-minimal – We start here in this post. In the last post, we implemented an example of token-based authentication/authorization. We have not yet added persistence or and authorization models, just seen how things worked. To review what we did, see ASP.NET Web Api: Understanding OWIN/Katana Authentication/Authorization Part I: Concepts. Branch: auth-db – The code we build up in the course of this post. 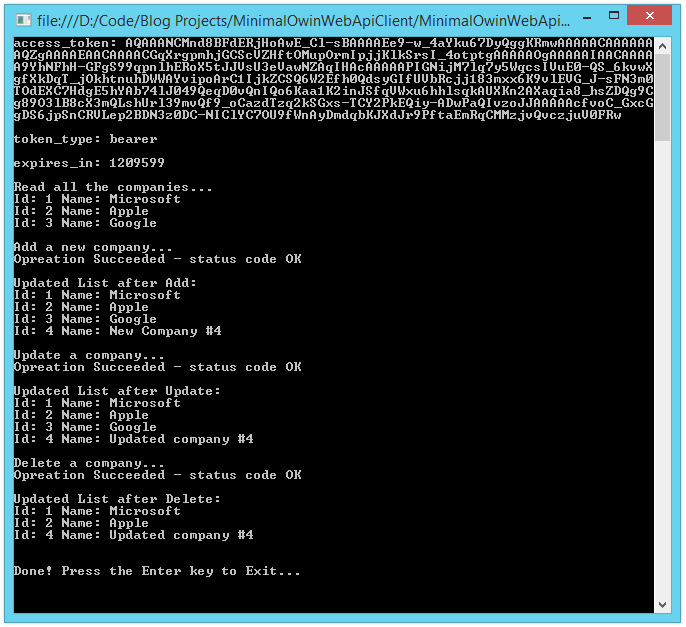 Branch: owin-auth – Added async methods, and token-based authentication calls to the Web Api application. This is where we left the code in the last post. We’ll be starting from where we left off in the last post. Recall that We had set up a basic embedded authorization server in our application which would process HTTP POST requests made by a client to the token endpoint, validate the user credentials/password received, and return an access token. From there, the client could submit the access token with subsequent requests to authenticate, and access whichever resources are available for the given identity and/or role. In reality, we would most likely check to see if there was a user in our backing store which matched whatever credentials were submitted, and then also check to see if the password submitted was valid. But not by checking against a plain text representation from our backing store! In order to flesh out this method, we need to model our authorization objects, and we need to persist some user data in our database. Above, we see a few basic models. We expect to have a user representation, and we do, in the form of the MyUserclass. While you may have been expecting to see a MyRole class, we have instead opted to carry on with the claims implementation we were using in our original project. Therefore, we have added a MyUserClaim class instead. We’ll discuss this further shortly. Finally, we have that odd-looking MyPasswordHasher class. As you may have guessed from the comment in the code, we are really only going to mock a proper hashing mechanism here. As before, we’re going to keep things simple for our example. In reality, one would apply a proven crypto library to this task, and proven, tried and true methods for properly hashing a password. Or, of course, use a library for such things, like Identity. Now that we have our auth-related entity models, we can add them to the existing ApplicationDbContext so that they can be modeled in the database, and we can access the data they represent from the context. Recall that we set this particular example application up to use a local, file-based database (SQL CE) however, everything we are doing here would work just fine with SQL Server as well. For our simple model set, and to keep concept straightforward, we are going to implement a simple MyUserStoreclass, and add sufficient functionality to get our application working and no more. In the code above, we have assembled a few basic methods to deal with persisting and retrieving User information. Note in the AddUserAsync() method, we perform some minimal validation (make sure a user with the same email address does not already exist). Also, see that we use our super-secret, super-secure MyPasswordHasher to hash, salt, re-hash, etc. our user password, and then we persist the hashed value (NEVER the clear-text password). In other words, at no point are we saving the user-submitted clear-text password to disk, anywhere. Similarly, we provide a simple PasswordIsValid() method which again uses the MyPasswordHasher class to compare the hash of the password submitted with that of a user record (which for now, would be submitted as an argument after being previously retrieved elsewhere in our code). The MyUserStore class provides simplistic examples of how one might implement some of this. There is minimal validation and exception handling here. This class works well for our example, and to demonstrate the concepts we are dealing with, but is not likely how you would do this in a production application. As we see above, we have taken advantage of the methods exposed on our new MyUserStore class to add two users, along with appropriate claims, to the database. Also recall we are deriving our initializer from DropDatabaseCreateAlways so that the database will be re-created and re-seeded each time we run the application. All that’s left to do now is update our GrantResourceOwnerCredentials() method to avail itself of our new user entities and data to perform its function. Here, we retrieve a user record from our store (if there is a record for the user credentials in the request), and then we create a new ClaimsIdentity for that user, much the same as before. This time, however, we also have a record of the various claims for this user, and we add those as well. In this case, we really only have the user’s name, and the role(s) our application recognizes for the user, but we could implement a more complex claims model if we needed. For now, we will stick with user name and roles, because the default authorization scheme, using the [Authorize] attribute, is pre-configured to work with user names and roles. We will look at customizing this in a later post. We can leave our Api Client application pretty much as-is at the moment. If you don’t have the client application set up, you can pull down the source for the project from the Github repo. 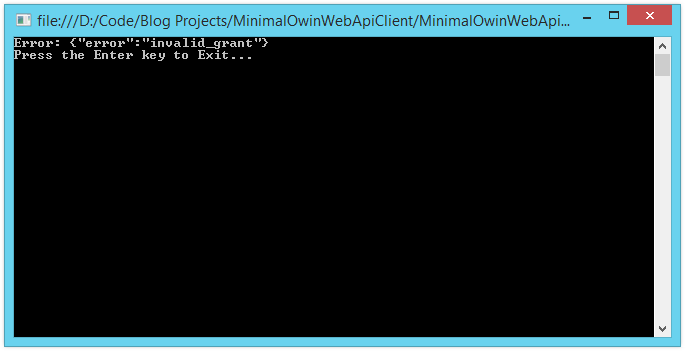 Make sure to checkout the branch owin-auth(not master!). The only thing we have changed in the above code is the password we are passing in with the token request – we have changed it to match the password for the user record we created in our Seed() method. Everything looks the same as it did when we wrapped up the previous post, because we haven’t changed anything the affects how the client application does its job. We’ve only changed the internals of our Web Api so that the embedded authorization server now knows how to retrieve user data from our database in order to authenticate a user, and perform a basic authorization check against the roles available to that user. Let’s see what happens when things go wrong. In this case, were get back an “Invalid Grant” because the client could not properly authenticate with the credentials provided. On the other hand, things look a little different is we request a token for a user which can be authenticated, but who is not authorized access to the resource requested. Also recall that we seeded two users in our database. The user “jimi” does not have a claim for the “Admin” role, but instead claims the “User” role. Let’s change the code in our client application to request an access token for “jimi” instead, and then see what happens. Unlike previously, we did not receive an invalid grant error, because the user credentials were properly authenticated. However, the user does not possess the proper Role claim in our system to access the protected resource. In reality, the default implementation of [Authorize] limits our ability to leverage claims to the fullest extent. [Authorize] recognizes claims for user names, and roles. What if we want more granular control over our application permissions? We’re not going to go into that in this post. However, keep this in mind, as leveraging Claims, and customizing authentication using claims instead of simple roles can become important for more complex application which require fine-grained control of permissions. In this post we created a “quick and dirty” implementation which performs some very basic authentication and authorization for our application. In the real world, we would definitely tend to some critical details, such as proper crypto for hashing passwords. We would also probably want to beef up our design by applying some common patterns of abstraction. Notice, we have coded everything here directly to the implementation class. Also, we have rather tightly coupled our logical processing to our persistence model. Lastly, we have put in place only the most rudimentary validation and exception handling. We could go down a long road exploring how to better separate our persistence mechanism from our authentication logic, and more effectively handling exceptions and errors. However, those details are often application-specific, and/or require a long, long post. Instead, we could now take everything we have learned, and pull in some ready-made components which already provide all of this, and more. If the work we have done so far has been beginning to look a little familiar, that is no accident. In the next post, we will implement our own authentication and authorization using the Identity 2.1 Framework.